Help prevent waste and build a community – this article was written by John Twitchen of env23.co for the Chartered Institution of Wastes Management as an RWM Ambassador. Please share, and don’t forget to send in your pics! Given recent events (and I’m talking about more than just the last week! ), I’ve felt an immense need to “JFDI”… get on with positive stuff and try to make a difference. This is also how I interpret what the RWM ambassadors programme is about; not the same old-same old. And given the events of the last week, we really need to focus on positive engagement that can stand on its own feet and not wait for some fantastic new policy, new government or new world order! Heck, we can’t even lean on European rules, regulations and targets any longer…! It’s down to good old-fashioned initiative. As the old saying goes, prevention is better than cure. Perhaps one good thing that could come from not needing to achieve (or one might say an even greater disregard for) compliance with EU-derived targets is that we will be able to crack on and focus a bit more on preventing waste, rather than (just) attempting to maximise the amount of recycling pounding its way through the system before zooming off to some other part of the world to be made into a new thing to be sold and consumed and discarded and… (as well as arguing the toss about what the real number is or should be or whether it’s good or bad or whatever). So can we stop with the excuses now, please? Refill-here.com is just that positive frame of mind; a positive campaign that focuses singularly on promoting positive action to address number two on the list of uber-consumerisms: the single-use coffee (or tea!) cup – three billion every year in the UK. Number one was the plastic carrier bag, btw (tick!). 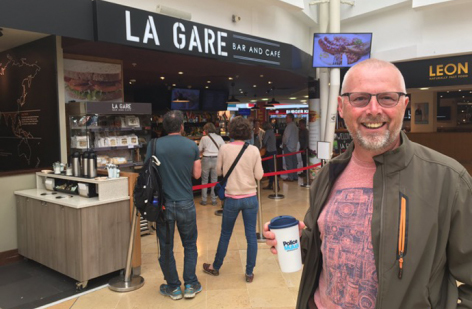 The aim is to make carrying your refillable mug around with you “normal” and remove the stigma of asking for a refill, encouraging cafés to enlist and demonstrate their support for the #refillrevolution. It’s classic “nudge” through positive norming and reinforcement. And it’s arguably something that the industry itself couldn’t/can’t do, because it’s not about “brand” first and foremost. By focusing on independent cafés, it taps into our vibrant café culture, celebrating individualism and promoting your “local”. “A nudge… is any aspect of the choice architecture that alters people’s behavior in a predictable way without forbidding any options or significantly changing their economic incentives. To count as a mere nudge, the intervention must be easy and cheap to avoid. Nudges are not mandates. Putting fruit at eye level counts as a nudge. Banning junk food does not…” So says Nudge. And the best thing about nudges is that they are relatively cheap, when coordinated. Certainly cheaper than imposing a blunt tax and associated infrastructure necessary to impose and collect and then distribute a relatively modest tax, charge or levy. It’s important to note the efforts the industry is now making to recycle more paper cups, with the recent signing of a new manifesto by the major retailers and supply chain partners pledging to increase recycling rates – less than 10 percent were estimated to have been recycled last year. However, prevention runs alongside recycling, especially in this space – so let’s go for it! Even just a two percent swing towards refillables would mean over half a million fewer cups. Refill-here.com is putting the fruit at eye-level, so to speak. It celebrates people and places that make a difference, one cup at a time. I’d urge you to get behind it – through remembering your mug, and talking about the cafés that support refills. Let refill-here.com know where you can #refill_here and help build the community! Here’s hoping there’s a greater focus on practical waste prevention at this year’s RWM exhibition by all the exhibitors, and by the NEC. I’ll make sure to #refill_here at the NEC and I hope you do, too… because action speaks louder than words.